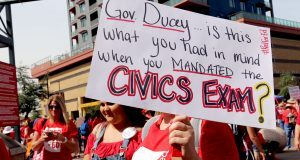 As Arizona teachers threaten to strike over low wages, Gov. Doug Ducey unveiled a revised budget proposal today that offers educators a 9-percent pay bump in the next school year. Labor unions are not only seeking pay raises but additional perks for union-covered Phoenix workers. The Arizona Republic reports labor groups want better health coverage, more vacation days and more protection for employees' rights.